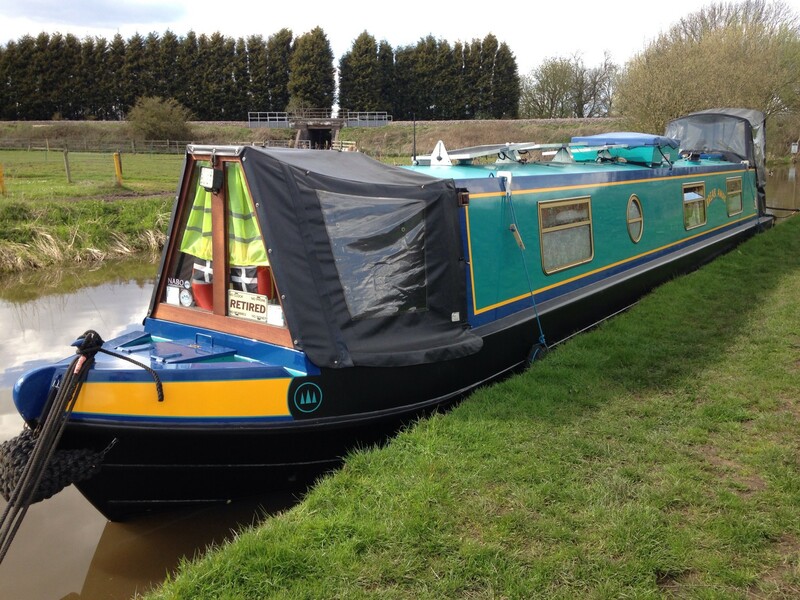 On Wednesday we moved through lock 8 on the Curdworth flight and found a nice place to moor for a couple of nights. We had a few jobs to do, and the weather was looking reasonable. Izzy having a rare treat being off the lead. After we moored a CaRT volunteer came to see if we were alright as the pound was low in places. He was checking the locks. After chatting with him, he reassured us that Birmingham was okay and we should be safe. I had already marked mooring spots on the map that the BCNS leaflet stated were reasonable. Our water pump needed attention as it was pumping when it shouldn’t. Charlie had already checked for leaks and satisfied there weren’t any, proceeded to strip the pump down and check it. He was suspicious that the non return valve was to blame. This was to be the case, and after a thorough cleaning, and everything back in place all seems to be working well again now. That was a morning’s job. We again washed the boats sides, and varnished the front cratch board. and stopped at Minworth as Asda wasn’t far away, and we needed to top up the fruit and veg. So far we haven’t met many boats, but after mooring up one passed us. We had a quiet mooring for the night despite houses being both sides of us. Asda was only 10 minutes away, and there was a Wickes so we could get some more varnish. Today we were off again as we needed to get to the sanitary station at the top of the Minworth flight of 3 locks. Unfortunately it had been vandalised, so was out of action; we managed to fill up with water though and now need to head for the next sanitary station within the next 2 days, as we are on our third cassette. Our journey today took us from the Birmingham and Fazeley canal and onto the Tame Valley canal, and the next few pictures shows the boat passing under spaghetti junction. Entrances to the GU canal in the foreground and the Birmingham and Fazeley arm continuation.This is Salford junction, and we are turning right here. Dating from 1844 it forms a canal crossroads. More spaghetti junction photos. Note the columns from the roadways in the canal. We had 2 more locks to do 12-13 of the Perry Barr locks. There is now alot more detritus in the canal and I managed to fish out multiple bottles, a paint can, and a fender (intact so very useful) at the lock. We still haven’t passed any other boats, and it seems very strange and quiet. There is one boat moored by the industrial estate where we are now, and just now one boat passed us going down. This obviously isn’t a hire boat destination as we have hardly seen any. The weather today has seen us have all the seasons in one; sun,rain,snow and hail!! Good job we had stopped before it started. Tomorrow we will be on our way again to get through the locks (11 more to do) to the sanitary station. Lets hope it is working. We now have a few more scratches below the gunwales! After getting our items at the retail park, we shuffled along the canal a bit further toward Fazeley; stopping by some very grand looking houses. On Sunday we had to move as our toilet cassette situation needed attention urgently. We got up early so we could get on the sanitary station, as I wanted to wash the other side of the boat with ease. We haven’t been particularly organised since being back on board, as I think we have got out of the habit of our routine, but Sunday we made sure we were organised so we could get everything done. Moored at sanitary station and whilst Charlie was dealing with the cassettes, and the water was filling, I managed to wash down the boat’s off side. I already had the washing machine on the go, and a small piece of beef cooking slowly in the oven (I had already cooked some roasted veggies on Saturday). Once all of the duties were completed we were off again, this time turning right at Fazeley junction and heading toward Birmingham. We stopped at Conveyors aqueduct by the RSPB bird sanctuary, where we had stayed a week in November. The last few days have been very quiet on the canal, with not many boats moving either way. The weather has gradually been getting colder, but we have had some bright intervals which helps the solar panels. Today as it was a sunny start we decided to move through the Curdworth locks. We only planned to do 4 today as we haven’t done any locks for 5 months, and we knew it would be hard. I, as usual walked Izzy between the locks. I had set the washing machine again, as it only holds 3kgs and I had towels and bedlinen to do. By the time we had reached the next water point the washing had finished, so we stopped and filled the tank again. And partook of a much earned coffee. 2 locks done and we got through the third which was in our favour this time, and by the canalside was The Dog and Doublet pub. There was a boat already moored here, there is a 48hr restriction. He advised us there was a boat coming down the next lock, so we pulled up and decided to stay, and partake of the local hostelry. The meals were typical pub grub, but reasonable price, and plenty of it. We also had a taste of the guest beer. The M42 runs parallel with this stretch of canal, but although we can see it, we can’t hear it! We came through on this stretch in 2011 on our first narrowboat holiday, but must say cannot remember any of the scenery. We may move tomorrow through the next lock, we will see what the weather is like first though. We stayed at Whittington for 2 nights and had what could be described as 2 days of summer! Lovely warm sunshine (not seen for many a month). We moved yesterday to the outskirts of Tamworth in the sunshine, as Charlie needed a new electric shaver; his last 2 being hand me downs finally giving up the ghost. I as usual decided to walk Izzy, whilst Charlie steered. On the way past Whittington a signpost marks the joining of the Birmingham and Fazeley canal with the Coventry canal. The canal between Fazeley and Whittington was built by the Birmingham and Fazeley company. The Coventry canal received it’s act of parliament in 1768, but seventeen years later was nowhere near completion. In frustration the Trent and Mersey and Birmingham and Fazeley companies undertook to jointly build the canal between Fradley and Fazeley. The two met at Whittington in 1790. The plaque was erected by the IWA commemorating the bicentenary of the joining. The canal then passes through Fisherwick where there a fields full of polytunnels. These weren’t evident in December when we passed through before, but are now resplendant along the way. I managed to walk about 2.5miles before hopping back on at Hopwas. There alot of boats were on the move and Charlie had to hold back through many of the bridges to let boats pass through. Some work also being done along the Hopwas wood stretch. I prepared dinner on the way so it would be ready on our arrival, as we wanted to walk to the shopping park in the afternoon. After mooring we showered (hot water heated by engine), had dinner, then walked to the retail park. Managed to source a shaver in Argos, a few items in Poundland, and booked Izzy for her annual booster in Pets at Home. Also ordered a couple of items in B&Q that would be ready for collection today. Today Izzy had her injection (not impressed). Currently we are waiting for B&Q to ring so we can collect our ordered items. I’ve prepared dinner and it is in the oven. Tomorrow we will move along to Fazeley junction so we can partake of the sanitary station there, and top up with water. We then want to moor at the RSPB park where we were in November, as the weather for the weekend isn’t looking very promising. We are heading for Birmingham, so there will be many locks to do! My computer guru son has sorted out my website problems and I can now publish the action shots of our smart new paintwork. We decided to hire a car to take us back to the boat, as we had been told we could get back on board on the 10th April. I had managed to source a lot of items during our trip on land, that I needed for the boat, therefore we needed to upgrade our hire car to a slightly larger one to get everything in. We ended up with a Nissan Qashqai. It was rammed to the rafters with our clothes and extra wares. We stopped on the way at Fazeley junction to rendezvous with the Little Chimney Co boat who had a rotating cowl made for us (ordered before Christmas). Charlie stayed with the car at Peels Wharf, and I legged it with the dog down the towpath to where their boat was moored. Cowl collected we were on our way back to Breakaway. We had been put on a mooring for the week as the boatyard didn’t want us cruising straightaway. We unloaded the car. The boat was quite tidy inside as it had been cleaned which was nice. We stuffed our wares inside, and then set off for lidl to top up the cupboards, as I had cleared them before we left. The next few days were spent tidying, and applying the polycarbonate sheets to the windows. This was made easier with the magnetic tape we had bought. We now have temporary double glazing, and we have noticed a difference in that the boat is warmer, and less condensation on the windows. Success at last. I managed to get some washing done too whilst on electric and water. Little pleasures! There was no hurry for us to move, so we decided we would move on Monday 18th. I ordered a bit more shopping from Asda, and they delivered it on Saturday. On Sunday we went for a short stroll along the towpath (only an hour and 20mins), and on our return our boat had been moved as the owners of the mooring had returned early! So Charlie decided to move out onto the cut. Good job I had got dinner on the go. He reversed back to the diesel point and we filled up. We already had a full tank of water, and we had emptied the toilet cassettes on Saturday. Off we went and moored just past the bridge heading in the direction of Fazeley. Now we have the added stress of newly painted boat being scraped when mooring! I’m trying not to be too precious about it, but have already been out with the paint pot today touching up the black where the boat had rubbed against a tyre whilst in the boatyard. Meanwhile this is our new livery, and we are quite pleased with it. We also had a bit of extra steelwork done with fender eyes, and a better hatch cover on our water tank space. We use the leftover space in where the plastic tank sits for storing milk and beer. It’s nice and cold in there. Also our chimney outlet was straightened up. We won’t be lighting a fire just yet. We can’t apply polish to the boat for 3 months, so meanwhile we have to just keep it clean. We will be off again tomorrow for Sutton Road Bridge, as we can access shops from there and Charlie needs a new electric shaver. Yesterday was lovely and sunny, so we decided to do the walking tour around old Leicester. We got a bus into the city centre and set off on the designated walking trail. There are interest boards along the way telling of the various periods in Leicesters history. The discovery of Richard the third has created much interest, and the city has done alot to encourage visitors. The tour starts at the site of the Blue Boar Inn. Nothing left today as now a Travelodge. At sunset on the 20th August 1485, Richard arrived in Leicester with his army, staying overnight at the Inn. The next morning he rode out of the city over the old Bow bridge on his way to fight Henry Tudor, in what became known as the Battle of Bosworth. The last battle of the War of the Roses. Alot of photo’s taken today along the route which depicts scenes that Richard would have known. The Guildhall. It dates back to medieval times, and would have been a building of importance in Richard’s time. The great hall was built in 1390, and would have been used by influential businessmen. In 1563 it became Leicester’s town hall. It escaped demolition in 1876, and in 1926 was completely restored. Turret gateway probably built in 1423. It separated the Newarke religious precinct from Leicester castle. Richard would have used this gateway when visiting the castle. It is possible that following his death his body would have been brought into the precinct through this gateway. Trinity hospital now part of de Montford university. By the time of Richard it had been providing care for 150 years. The hospital was rebuilt in 1776. This photo is the surviving medieval stone chapel. The Magazine gateway would have been the entrance to the religious precinct, and was once called the Newarke gateway. It was called the Magazine gateway in reference to it’s use during the English Civil War as a gunpowder and weapons store. King Richards corpse would have passed through this gateway on the way to Greyfriars where he was buried. St Mary de Castro church built within the fortified enclosure of Leicester castle. It is likely that Richard would have worshipped here when visiting the castle. He may even have prayed here the day before setting off for Bosworth. Leicester castle looks very modern, but it’s facade is 17th century; this is hiding the 12th century structure that Richard would have been familiar with and he probably would have visited the castle on several occasions. Leicester cathedral entrance. The Normans began the construction 900 years ago. It was enlarged between the 13th and 15th centuries and became the civic church. In the late 19th century the church was restored and the tower built including the addition of a 220ft tower. When the diocese of Leicester was re-established in 1926 the church was hallowed in 1927 as Leicester cathedral. It is now the final resting place of Richard. On 22nd August 1485 after fighting bravely to defend his crown, Richard was killed in battle and Henry Tudor became King of England. Richard’s naked body was slung over a horse and brought back to Leicester. Once in Leicester his body was displayed before being buried in Greyfriars by the monks there. He was 32 years old, and had been King for 2 years. He was the last English King to die in battle. The Battle of Bosworth was the last charge of knights in full medieval armour. Richard was the last of the Plantagenet Kings. His death signalled the end of the medieval period. Richards tomb made from Swaledale fossil stone, sitting on Irish black granite. The coat of arms is made from semi-precious stones. Opposite the cathedral is the new King Richard 111 visitor centre, this has been created around the poignant place where his remains were found. The centre also tells the story of Richards life and death; and of how the dig to find his remains came about. We partook of a 20 minute show in the Guildhall about Richard, which was free to enter and very enjoyable. We then had a look around inside. We had a very interesting day, lunch out and walked our legs off. The grandchildren have been at a holiday club this week so peace and quiet reigns!